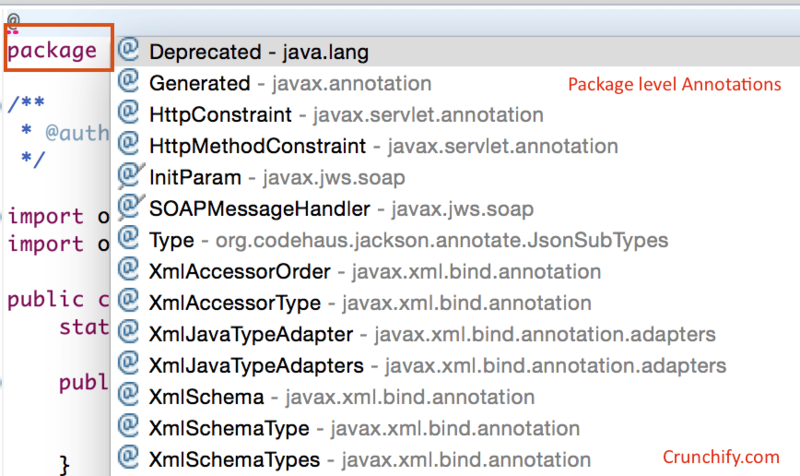 How and where are Annotations used in Java? An annotation, in the Java computer programming language, is a special form of syntactic metadata that can be added to Java source code. Classes, methods, variables, parameters and packages may be annotated. Unlike Javadoc tags, Java annotations can be reflective in that they can be embedded in class files generated by the compiler and may be retained by the Java VM to be made retrievable at run-time. It is possible to create meta-annotations out of the existing ones in Java, which makes this concept more sophisticated. @Override – Checks that the function is an override. Causes a compile warning if the function is not found in one of the parent classes. @Deprecated – Marks the function as obsolete. Causes a compile warning if the function is used. @Retention – Specifies how the marked annotation is stored—Whether in code only, compiled into the class, or available at runtime through reflection. @Documented – Marks another annotation for inclusion in the documentation. 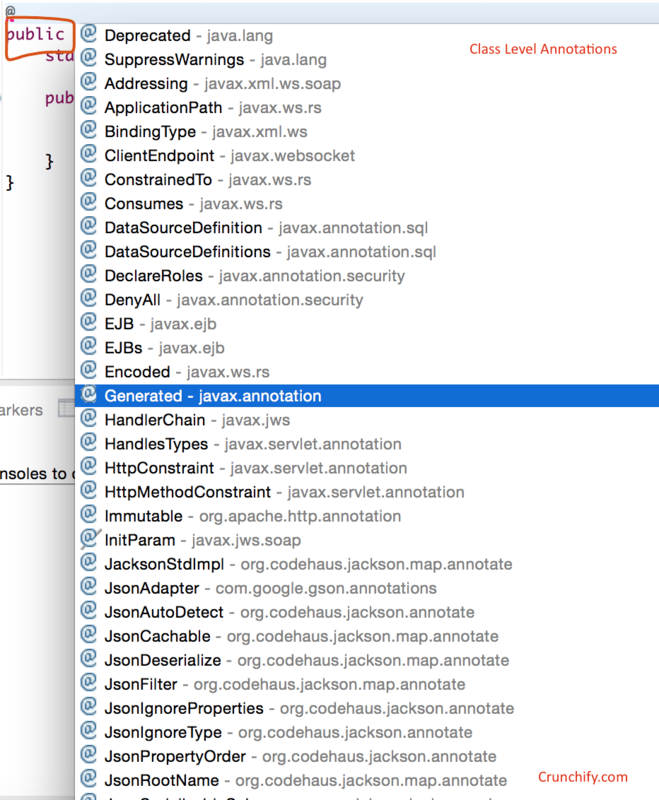 @Target – Marks another annotation to restrict what kind of java elements the annotation may be applied to. @Inherited – Marks another annotation to be inherited to subclasses of annotated class (by default annotations are not inherited to subclasses). Its presence indicates to the compiler that the annotated method must override an existing superclass method. is in fact not an override – the method name has all lower case letters, so it doesn’t exactly match the name of the hashValue()method. It will however compile perfectly well. Such an error is easy to make, and difficult to catch, which is a dangerous combination. Using the @Override annotation prevents you from making such errors. You should be in the habit of using @Override whenever you override a superclass method. This annotation indicates that the marked element is deprecated and should no longer be used. The compiler generates a warning whenever a program uses a method, class, or field with the @Deprecated annotation. When an element is deprecated, it should also be documented using the Javadoc @deprecated tag, as shown in the following example. Just tell compiler, please don’t shout. I know what I’m doing. RetentionPolicy.SOURCE—Annotations with this type will be by retained only at the source level and will be ignored by the compiler. RetentionPolicy.CLASS—Annotations with this type will be by retained by the compiler at compile time, but will be ignored by the VM. RetentionPolicy.RUNTIME—Annotations with this type will be retained by the VM so they can be read only at run-time. In this example, the @Retention(RetentionPolicy.RUNTIME) annotation indicates that your Crunchify_Retention annotation is to be retained by the VM so that it can be read reflectively at run-time. Now try to run Java Doc command and see output. ANNOTATION_TYPE. The annotated annotation type can be used to annotate annotation type declaration. CONSTRUCTOR. The annotated annotation type can be used to annotate constructor declaration. FIELD. The annotated annotation type can be used to annotate field declaration. LOCAL_VARIABLE. The annotated annotation type can be used to annotate local variable declaration. METHOD. The annotated annotation type can be used to annotate method declaration. PACKAGE. The annotated annotation type can be used to annotate package declarations. PARAMETER. The annotated annotation type can be used to annotate parameter declarations. TYPE. The annotated annotation type can be used to annotate type declarations. You can have multiple values in the Target annotation. In this example, Superclass has been explicitly annotated with both @ForEveryone and @JustForMe. Subclass hasn’t been explicitly marked with either one; however, it inherits @ForEveryone because the latter is annotated with @Inherited. @JustForMe isn’t annotated, so it isn’t inherited by Subclass.